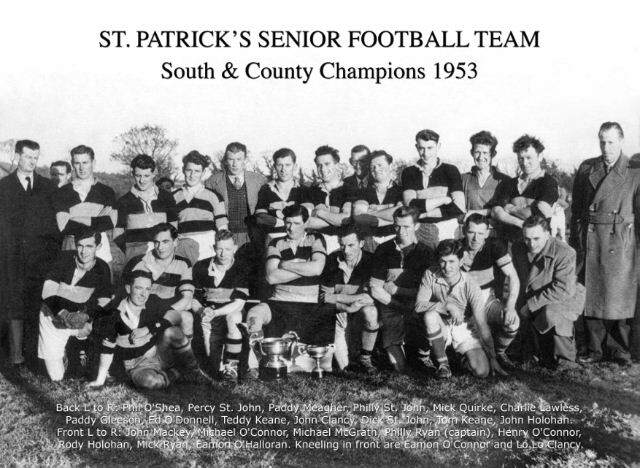 1953 was probably the most successful year ever for the GAA in our parish with St.Patrick’s (Cloneen) winning the county senior football title and Drangan winning the county junior title. The St.Patrick’s senior team was mainly a Cloneen team with the assistance of Paddy Gleeson and Michael McGarry from Drangan while the junior team was mainly a Drangan team with the assistance of Michael McGrath and John Clancy from Cloneen. St. Patrick’s defeated Burncourt in the opening round by 1-9 to 0-3 which secured a place for them in the south semi-final against Cahir Slashers. In the semi-final St. Patrick’s had a good win over Cahir on a scoreline of 2-10 to 0-7. The south final which was played at Kilsheelin saw our men taking on the reigning champions Old Bridge. The game was marred by a constant downpour of rain from start to finish which made playing conditions very difficult. In a report on the game published in the “nationalist” St. Patrick’s were said to have adapted themselves better to the playing conditions , in fact they seemed to revel in them. Tom and Teddy Keane provided a stone wall defence and were well assisted by Paddy Gleeson , Charlie Lawless and company. Paddy Meagher and Mikey O’Connor dominated mid field while up front Ryan, McGrath and McGarry are credit with most of the scores. The final score was St.Patrick’s 2-7 Old Bridge 1-1. In the County semi-final St. Patrick’s defeated Galtee rovers by the narrowest of margins on a scoreline of St. Patrick’s 1-4 Galtee Rovers 2-0. However St. Patrick’s place in the county final was put on hold as Galtee Rovers lodged an objection to the eligibility of Paddy Gleeson and Tom Keane to play and they also alleged that the referee was improperly appointed . The County board ordered a replay which St. Patrick’s appealed to the munster council. The munster council ruled that the county board was wrong in ordering a replay but this still was not the end to the saga as the county board appealed the munster council decision to the central council. The central council rejected the appeal and after a lot of boardroom drama St. Patrick’s were eventually cleared to play the county final. St. Patrick’s opponents in the county final were Ballingarry who were competing in the mid-division at the time. It was reported to have been one of the best county senior football finals witnessed for many years. Played in ideal conditions the game was said to have been exhilarating with the result in doubt right up to the final whistle. St .Pat’s who led throughout the game seemed to last the pace better and at the finish of a gruelling struggle appeared to have a little extra. Ballingarry who tried gallantly to break through the St. Patrick’s back line almost forced a draw when they were awarded a free in front of goal in the dying seconds. But the free was kicked wide and St. Patrick’s were crowned county champions by the narrowest of margins. The final score was St. Patrick’s 0-5 to Ballingarry 0-4. This was St. Patrick’s first senior county title since ‘47. The team was trained by Michael Morrissey, Cappagh and Philly Ryan was team captain. The following is a poem written by Jimmy Roche Ballinard in honour of this great team of ’53. Of the boys of Annerside. Stood guard by goalman Ryan. When the pace began to tell. Gave of their very best. And the home of Smith O’Brien. This entry was posted on November 20, 2013 at 3:03 pm and is filed under Football. You can follow any responses to this entry through the RSS 2.0 feed. You can leave a response, or trackback from your own site.